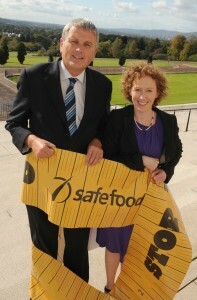 Pictured are Marian Faughnan Chief Specialist of Nutrition, Safefood and Jim Wells, DUP, Health Committee Chairman, South Down. With almost 60% of people in Northern Ireland classified as either overweight or obese, MLAs from all parties are lining up to demonstrate their support of safefood’s ‘Stop the Spread’ campaign, which urges people to check their waist measurement to see if they are overweight. If you are a woman with a waist size greater than 32 inches or a man with a waist of 37 inches or more, it’s clear that you are carrying excess weight. Launched in May 2011, the ‘Stop the Spread’ campaign is a two-year, all island campaign comprising television, radio and outdoor advertising, as well as online support at www.safefood.eu. 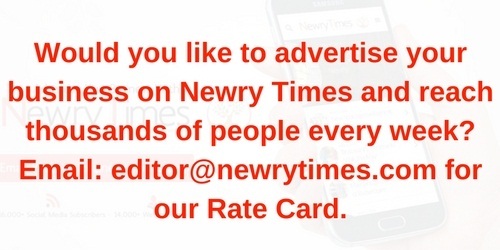 Newry Times caught up with Jim Wells, DUP South Down MLA, to find out what he’s been doing to tackle this weighty issue. Do you think you have a healthy lifestyle? Wells: I try my best, but the sedentary lifestyle of an MLA puts barriers up everywhere. I am a vegetarian who doesn’t smoke or drink alcohol, but I’m sure I can always be doing something extra to look after my body. How often do you exercise? Wells: I always try to walk my two dogs as often as possible, and sometimes I have to run to meetings when things get hectic. Overall though, I would say around four times a week on average. Do you know how to get your true waist measurement? Wells: Yes! It’s quick to do and easy if you know how! To measure your waist correctly, feel the bottom of your ribs and the top of your hipbones; your waist lies between these 2 points, normally where your bellybutton is. When measuring your waist, it’s important to remember it’s not where your trousers sit (or the waist size of clothes you buy). Safefood is distributing thousands of free tape measures to pharmacies across Northern Ireland over the coming week, so if you don’t have one at home, there will be a free one nearby. There’s no excuse! Have you measured yourself recently? Wells: Thanks to the safefood’s Stop the Spread campaign, I was confronted with my bodily dimensions once a week for over eight weeks. It certainly made me wake up to what my true measurements were. Like a lot of people out there, I used to think that I was the same weight and shape as I had been in my 30’s – if only that were true. If you could change one thing in your lifestyle, what would it be? Wells: I would love to find time to do more exercise, to be able to walk further. Unfortunately, I am often confined to my car, getting from A-to-B. When it comes to food, what’s your biggest weakness? Wells: Chips – they are most definitely my Achilles heel at the dinner table. What do you do to relax? Wells: I am a keen bird watcher, so when I can, and weather-permitting, I get out my hiking boots and binoculars and follow the flock. What are your health goals for 2012? Wells: I would love to take an inch or two off from round my waist. You recently changed your diet and lifestyle for safefood’s Stop the Spread campaign – what have you learned? Wells: Stop eating so many chips, and eat less starch-filled foods. Useful tips and information on weight loss can be found on the ‘Stop the Spread’ pages on the safefood website and on the Facebook page. Further information on ‘Stop the Spread’ is available at www.safefood.eu or by calling safefood on 0800 085 1683.